Among roadsters the ultimate market, the Aprilia Tuono V4 wins again in displacement and power for 2015… But the surprise comes indeed! 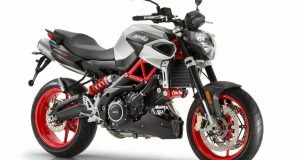 With its new suspensions, Italian flies over potholes, fittings and never takes the keypad as. A sports roadster also comfort as a road? 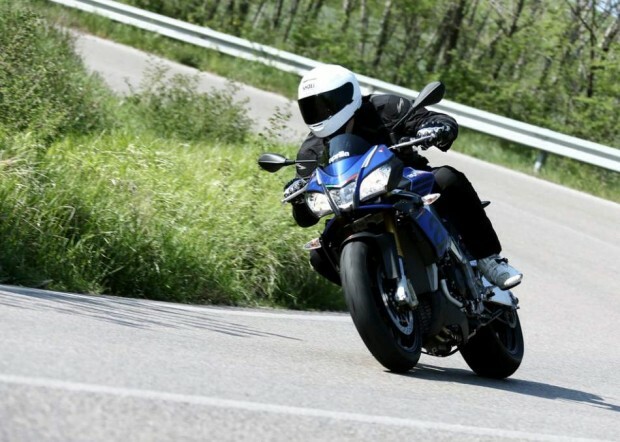 Obviously, the new Aprilia Tuono V4 1100 RR 2015 has not become a road type Yamaha FJR. No. But the work on suspensions is stunning! Have the fork and shock absorber dipped in the magic potion? A priori no. The trademark of all? Sachs. And if I tell you that the inverted fork is treated Titanium Nitride to eliminate friction and that the shock absorber is equipped with a nitrogen tank ‘Piggy Back’, I’m not sure that it speaks to you more? Okay, what is certain, is that after a small loop of only 60 km, the new Tuono is more as stiff as before, although on the contrary. 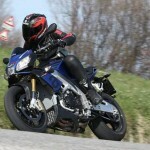 It is strangely soft, smoothly, and despite really bashed and Italian roads, slippery coating the Tuono with its 175 HP is among the safer roadsters of the market… Yes, Yes, you read! Seen from this angle, you would think that the journalist has consumed illegal substances. But not. 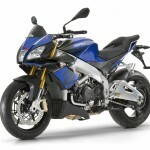 Seen in profile, face or top, the Tuono 2015 does not fundamentally change the previous. It retains its sharp lines, its magnificent rear shell which recalls the RSV4 and two headlights in almond. Except that in reality, the fork Crown loses 1.5 kg and a position led lamp takes place at the centre. Also hard to see an any change in the driving position, yet the handlebar is narrower and it is true that this narrowness facilitates the rise of file despite a really ‘symbolic ” steering angle The seat also has changed since we are left with the buttocks to 825 mm above floor level, 15 mm less than before. Also, I searched the potion or any pads stashed away under the saddle to explain why the Tuono does more harm to the behind, but I found nothing… Ah if the bike is blue! Blue like the light of the Italian police who has shortened our loop then our butts could support 100 km more! 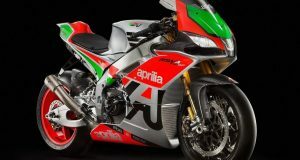 It’s true, it was riding the Tuono, it was launched at the assault on the roads surrounding the Misano circuit where you also tried the Aprilia RSV4 RF. With its new V4 of 1100 cm3, the Italian is indeed more torquey and more powerful 5 HP with 121 Nm at 9 RPM. But the difficulty on a roadster like this, is to feel the real difference against the previous model. And there, on road, honestly, the 175 HP we have much served. But they are there, under the handle, managed by the ride-by-wire that has been properly reviewed. Just as the mapping who abandons the ‘Rain’ level, but which retains 3 modes (Track, Sport and Race) with all full power. However, depending on the selected mode, mapping delivers 175 HP out of less brutally than before with more or less engine braking. 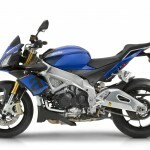 If torque gain is actually noticeable at midrange, the Tuono retains a pleasant sweetness in the management of the gas. On slippery roads that we travel far, the thin film of dust was finally more a problem. It would have been easy to go sledding with another two times less potent same bike, here, with electronic assistance, the Tuono has been Imperial and hyper-securisante. Paradoxically, with its 175 HP, his ABS and the traction control adjustable to 8 positions, Italian is riveted to the floor and electronics prevents from losing the rear. However, the Pirelli Diablo Rosso Supercorsa adhere particularly well. They offer a still as nimble as before motorcycle and road holding is difficult to fault.